Magnetic induced strain in fiber for bone tissue growth and an assay of cell adhesion strength – a talk by Dr Athina Markaki. Dr Athina E Markaki, Lecturer and Fellow of Robinson College at the University of Cambridge, focuses her research in the development of fibre network materials and the control of their shape with magneto-mechanical actuation, using ferromagnetic fibres. This effect is being explored for biomedical applications, including magnetically active layers on the surface of prosthetic implants, which deform elastically on application of a magnetic field, stimulating in-growth of bone tissue via the creation of mechanical strain on the cell network, and hence improving the bonding between prosthesis and bone. Austenitic (316L) and ferritic (444) stainless steels are being used in this study to manufacture the fibres. Both steels have a similar composition and grain structure, with 444 being ferromagnetic. Grain structure of ferritic stainless steel. 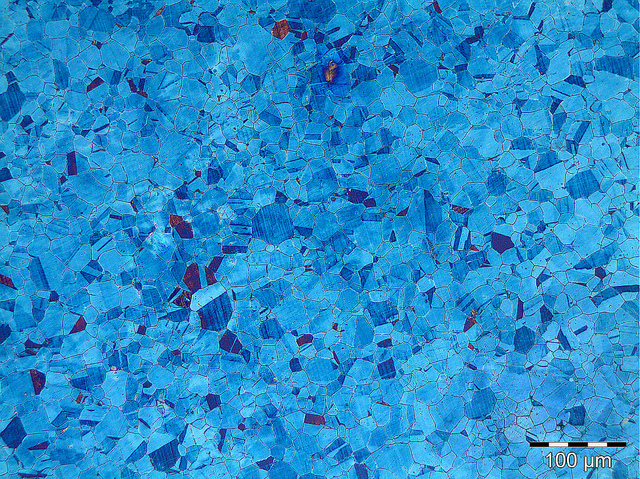 Optical microgragh of grain structure obtained by tint etching. Credit of the image D. Kokkoris and Athina Markaki, University of Cambridge. Dr Markaki was invited speaker at our last Biomaterials Seminar on Tuesday the 15th. She talked in detail about her work with a”Magneto-Active Scaffold for Stimulation of Bone Growth“. Fibre network materials have the potential for actuation in vivo, since they can exhibit controlled reversible shape changes. This effect is being explored for magnetically active layers on the surface of prosthetic implants, which deform elastically on application of a magnetic field, to deliver local strain in in-growing bone tissue. The design draws on the concepts of strain-regulated bone remodelling and modelling. In a second part of her talk, Dr Markaki talked about an “Accelerated Buoyancy Assay for Assessing Cell Adhesion Strength“. This assay combined with 3-D morphometric analysis is being used to assess osteoblast adhesion on microgrooved substrata. An investigation is carried out on the effect of the micro-grooved surface topography on cell adhesion strength, cell and nucleus volumes, and attachment patterns.